Know your stats. If you haven’t taken a look at your social media analytics recently (or at all), pull your Facebook page engagement numbers from Insights, look up your highest performing Tweets in Twitter Analytics, etc. Here’s a great resource from Keynote/Workshop Presenter Beth Kanter on analytic tools. Bring your social media plan. If you have a communications plan with a social media component, you’re already off to a great start. We recommend bringing a copy with you that you can refer to during the conference. Subscribe to our Twitter list. We’ve been adding all of the attendees, presenters, and sponsors to a special Twitter list that you can subscribe to. It’s an easy way to follow those who will be live-tweeting during the event and to stay connected with your fellow nonprofits. Watch the Online Fundraising Panel preview videos. Leaders from the VMFA, Sportable, Randolph-Macon College, and Studio Two Three will be talking about their strategies for online fundraising success at the Conference. Learn about their campaigns beforehand so you can come to the event prepared for the Q&A. Bring these! Be sure to bring your mobile device, something to take notes on, and business cards for networking. Directions & Parking: The event is being held at the Cultural Arts Center at Glen Allen – 2880 Mountain Road, Glen Allen, 23060 – located in northern Henrico County between Staples Mill Road and Woodman Road, just south of 295. There is ample parking on-site. Take exit 45B – Woodman Road South. Go to the light. Take I-64 W. to 295 toward Washington D.C. Take exit 45B – Woodman Road South. Go to the light. Turn right onto Mountain Road. Go 3/4 mile and the Cultural Arts Center is on your right. Post live on social media for a chance to win at the Conference! CW Richmond is sponsoring a Social Media Contest. 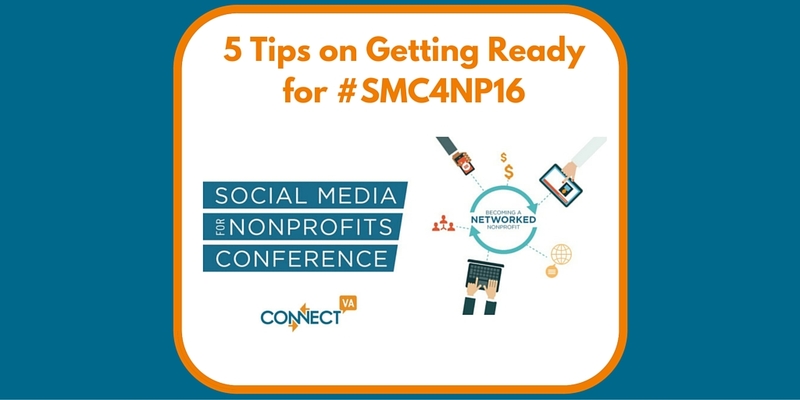 Tweet, post to Facebook or Instagram during the event using #SMC4NP16, and your organization, or a nonprofit organization of your choice, could win a $2,250 value TV commercial production and placement from CW Richmond* OR free passes to board training and a Nonprofit Learning Point course. We are so excited for this event, and can’t wait to see you there. If you have any questions, e-mail us at info@connectva.org.